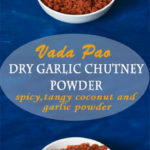 Vada Pao Dry Garlic Powder Recipe | Dry Garlic powder recipe-Learn how to make the irresistibly spicy ,tangy and a bit sweet coconut chutney powder or popularly called Vada Pao Dry garlic chutney powder.This is an authentic recipe from Maharashtra and eaten as a filling or as an accompaniment with the most popular Vada Pao. A staple in Mumbai,a humble piece of Pao stuffed with a fried potato dumpling seasoned and cooked with bursting flavors of ginger garlic and curry leaves. You can make it as spicy as you wish. Although the green chutney served along the chili garlic powder on the side, you may want to check how spicy you can handle. Vada means a potato dumpling and Pao means a small loaf of bread. There would hardly be anyone who wouldn’t have tasted this very ordinary but a dish with exquisite flavors. Or at least heard of our very own Mumbai Vada Pao. I being a Dehliite ,still call it “our” as this dish has surpassed the all geographical boundaries. 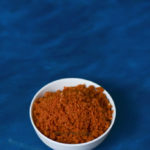 Coming back to the Dry Chili Garlic Powder chutney with coconut, this chutney powder can be made in advance and stored in your fridge for as long as up-to a month.You need chopped fresh garlic, coriander powder, peanuts, coconut powder, 2 dry red chillies,salt and sesame seeds powder. Nowadays, there are many variations to vada pao as well.This garlic powder compliments each and almost every flavor you may try. I sometimes add this powder to my poha too or when i make my Vada Sandwich. Cut the Pao in two pieces, apply sweet tamarind chutney on one side and Green Chutney on the other side. Add the dry garlic powder on the base and place the Vada on top.Place a green chili on top and close the Pao with the other half on top. Serve with some extra chutneys and garlic powder for more flavor. Dry garlic powder is a sweet tangy and chili powder best served with Mumbai style Vada Pao.Its varied usages make it more versatile. In a mixer jar, put all the roasted ingredients cooled. Make a coarse powder and store in a jar.Keep the jar open for a few minutes for it to cool down completely. As any moisture or heat may spoil the power. serve with your Vada Pao or fill inside. 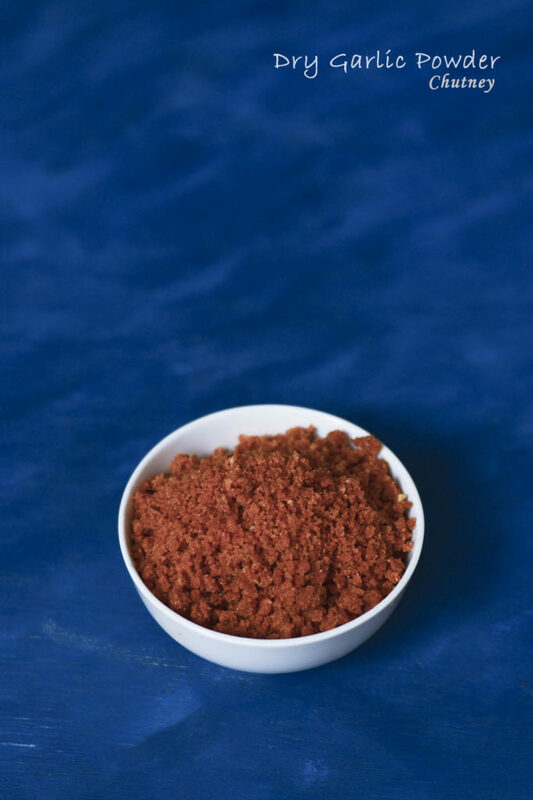 This powder can be used with many other dishes.